- top up the swimming pool. - connect for internal use to the toilet and washing machine. 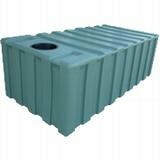 We can supply you with Polyethylene or Colourbond water tanks fully certified with a 20 year manufacturers warranty. 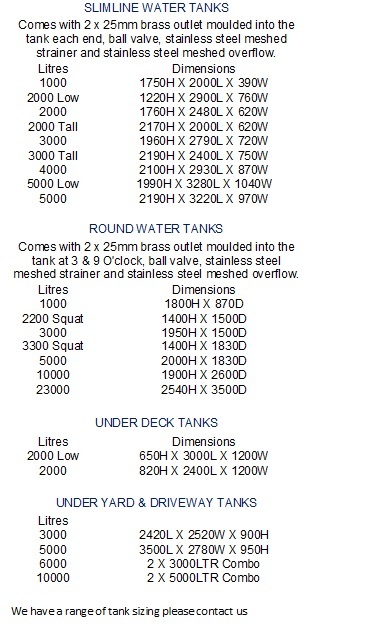 Tanks styles are slimline, round, underdeck or underground and come in standard sizes or colorbond tanks can be customised to suit. Poly Water Tanks are 100% UV stabilised for Australian conditions with 100% food grade material which come complete with two brass outlets moulded into the tank, ball valve (tap), stainless steel meshed strainer and stainless steel meshed overflow. 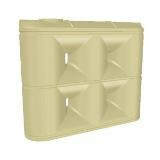 Below are some of the sizes available for our Poly Tanks. 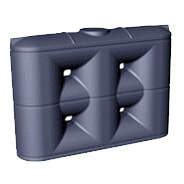 ​For other tank dimensions and colorbond/metal tank sizing please contact us.